Information About The Hamilton Area - GoWest Realty Ltd. If you have any questions or would like more information about Hamilton, Ontario please Contact Us. If you are planning on buying your next dream home visit our Buyers Page. If you are planning on selling your home visit our Sellers Page. Hamilton population 670,580; CMA population 721,053) is a port city in the Canadian province of Ontario. Conceived by George Hamilton when he purchased the Durand farm shortly after the War of 1812, Hamilton has become the centre of a densely populated and industrialized region at the west end of Lake Ontario known as the Golden Horseshoe. On January 1, 2001, the new City of Hamilton was formed through the amalgamation of the former city and the other constituent lower-tier municipalities of the Regional Municipality of Hamilton-Wentworth with the upper-tier regional government. Residents of the old city are known as Hamiltonians. Since 1981, the metropolitan area has been listed as the ninth largest in Canada and the third largest in Ontario. Hamilton is home to the shared Royal Botanical Gardens, the Canadian Warplane Heritage Museum, the Bruce Trail, McMaster University and Mohawk College. The Canadian Football Hall of Fame can be found downtown right beside Hamilton City Hall and across town to the east, the Canadian Football League's Hamilton Tiger-Cats play at Ivor Wynne Stadium. Partly because of its diverse environment, numerous TV and film productions have been filmed in Hamilton, regulated by the Hamilton Film and Television Office. A growing arts and culture sector garnered media attention in a 2006 Globe and Mail news article, entitled "Go West, Young Artist," which focused on the growing art scene in Hamilton. The article highlighted local art galleries, recording studios and independent film production. Initially, this town was not the most important centre of the Gore District. A permanent jail was not constructed until 1832 when a cut-stone design was completed on one of the two squares created in 1816, Prince's Square. Subsequently, the first police board and the town limits were defined by statute on February 13, 1833. Official City status was achieved on June 9, 1846, by an act of Parliament, 9 Victoria Chapter 73. As the city grew, several prominent buildings were constructed in the late 19th century, including the Grand Lodge of Canada in 1855, West Flamboro Methodist Church in 1879 (later purchased by Dufferin Masonic Lodge in 1893), a public library in 1890, and the Right House department store in 1893. The first commercial telephone service in Canada, the first telephone exchange in the British Empire, and the second telephone exchange in all of North America all were established in the city between 1877–78. Though suffering through the Hamilton Street Railway strike of 1906, with industrial businesses expanding, Hamilton's population doubled between 1900 and 1914. Two steel manufacturing companies, Stelco and Dofasco, were formed in 1910 and 1912, respectively, and Procter & Gamble and the Beech-Nut Packing Company opened manufacturing plants in 1914 and 1922, respectively, their first outside the US. Population and economic growth continued until the 1960s, with the 1929 construction of the city's first high-rise building, the Pigott Building, the move of McMaster University from Toronto to Hamilton, the opening of the second Canadian Tire store in Canada in 1934, an airport in 1940, a Studebaker assembly line in 1948, the Burlington Bay James N. Allan Skyway in 1958, and the first Tim Hortons store in 1964. Since then, many of the large industries have moved or shut down operations, and the economy has shifted more toward the service sector, such as transportation, education, and health services. On January 1, 2001, the new city of Hamilton was formed from the forced amalgamation of the Regional Municipality of Hamilton-Wentworth and its six municipalities: Ancaster, Dundas, Flamborough, Glanbrook, and Stoney Creek. Before amalgamation, the "old" City of Hamilton had 331,121 Hamiltonians divided into 100 neighbourhoods. The new amalgamated city has 490,268 people in over 100 old neighbourhoods, and surrounding communities. Hamilton is located in Southern Ontario on the western end of the Niagara Peninsula and wraps around the westernmost part of Lake Ontario; most of the city, including the downtown section, is on the south shore. Hamilton is situated in the geographic centre of the Golden Horseshoe and is roughly the midway point between Toronto and Buffalo, New York, although slightly closer to the former. Its major physical features are Hamilton Harbour, marking the northern limit of the city, and the Niagara Escarpment running through the middle of the city across its entire breadth, bisecting the city into 'upper' and 'lower' parts. The maximum high point is 250m (820') above the level of Lake Ontario. According to all records from local historians, this district was called "Attiwandaronia" by the native Neutral people. The first aboriginals to settle in the Hamilton area called the bay Macassa, meaning beautiful waters. Hamilton is one of 11 cities showcased in the book, "Green City: People, Nature & Urban Places" by Quebec author Mary Soderstrom, which examines the city as an example of an industrial powerhouse co-existing with nature. Soderstrom credits Thomas McQuesten and family in the 1930s who "became champions of parks, greenspace and roads" in Hamilton. Burlington Bay is a natural harbour with a large sandbar called the Beachstrip. This sandbar was deposited during a period of higher lake levels during the last ice age, and extends southeast through the central lower city to the escarpment. Hamilton's deep sea port is accessed by ship canal through the beach strip into the harbour and is traversed by two bridges, the QEW's Burlington Bay James N. Allan Skyway and the lower Canal Lift Bridge. Between 1788 and 1793, the townships at the Head-of-the-Lake were surveyed and named. The area was first known as The Head-of-the-Lake for its location at the western end of Lake Ontario. John Ryckman, born in Barton township (where present day downtown Hamilton is), described the area in 1803 as he remembered it: "The city in 1803 was all forest. The shores of the bay were difficult to reach or see because they were hidden by a thick, almost impenetrable mass of trees and undergrowth...Bears ate pigs, so settlers warred on bears. Wolves gobbled sheep and geese, so they hunted and trapped wolves. They also held organized raids on rattlesnakes on the mountainside. There was plenty of game. Many a time have I seen (sic) a deer jump the fence into my back yard, and there were millions of pigeons which we clubbed as they flew low." George Hamilton, a settler and local politician, established a town site in the northern portion of Barton Township in 1815. He kept several east–west roads which were originally Indian trails, but the north–south streets were on a regular grid pattern. Streets were designated "East" or "West" if they crossed James Street or Highway 6. Streets were designated "North" or "South" if they crossed King Street or Highway 8.The overall design of the townsite, likely conceived in 1816, was commonplace. George Hamilton employed a grid street pattern used in most towns in Upper Canada and throughout the American frontier. The eighty original lots had frontages of fifty feet; each lot faced a broad street and backed onto a twelve foot lane. It took at least a decade for all of the original lots to be sold, but the construction of the Burlington Canal in 1823, and a new court-house in 1827, encouraged Hamilton to add more blocks around 1828–9. At this time, he included a market square in an effort to draw commercial activity onto his lands, but the natural growth of the town was to the north of Hamilton's plot. Panoramic view of lower Hamilton from Sam Lawrence Park near Concession Street on the Niagara Escarpment (Hamilton Mountain). Hamilton's climate is humid-continental, characterized by changeable weather patterns. However, its climate is moderate compared with most of Canada. Hamilton's location on an embayment at the south-western corner of Lake Ontario with an escarpment dividing upper and lower parts of the city results in noticeable disparities in weather over short distances, this is also the case with pollution levels, which depending on localized winds patterns or low clouds can be high in certain areas mostly originating from the city's steel industry mixed with regional vehicle pollution. With a July average of exactly 22.0 °C (71.6 °F), the lower city is located in a pocket of the Dfa climate zone found at the south-western end of Lake Ontario (between Hamilton and Toronto and eastward into the Niagara Peninsula), while the upper reaches of the city fall into the Dfb climate zone. The airport's open, rural location and higher altitude (240m vs. 85m ASL downtown) results in lower temperatures, generally windier conditions and higher snowfall amounts than lower, built-up areas of the city. One exception is on early spring afternoons, when colder than air lake temperatures keep shoreline areas significantly cooler, under the presence of an east or north-east onshore flow. According to the 2006 Canadian Census, more than 20 percent of the local population was not born in Canada. This is the third highest such proportion in Canada after Toronto at 49%, and Vancouver at 39%. Between 2001 and 2006, the foreign-born population increased by 7.7% while the total population of the Hamilton census metropolitan area (CMA) grew by 4.3%. The share of Canada's recent immigrants who settle in Hamilton has remained unchanged since 2001 at 1.9%. Hamilton was home to 20,800 immigrants who arrived in Canada between 2001 and 2006, half of whom were born in Asia and the Middle East, while nearly one-quarter (23%) were from Europe. Hamilton also had a high proportion of people with Italian, English, Scottish, German and Irish ancestry. Nearly three in ten residents reported English as their sole ethnic origin or as one of their ancestral origins. As well, nearly one in five reported Scottish ancestry either alone or in combination with another ethnic origin. Hamilton also has a large French community for which provincial services are offered in French. In Ontario, urban centres where there are at least 5000 Francophones or where at least 10% of the population is francophone are designated areas where bilingual provincial services have to be offered. There are francophones schools and churches, along with a cultural and community centre created by the Francophone community in 1971: the Centre français Hamilton inc. (centrefrancais.ca). The Centre français Hamilton inc. organizes social and cultural activities to promote the use of the French language in Hamilton, and also helps francophone newcomers integrate into the community. The top countries of birth for the newcomers living in Hamilton in the 1990s were: former Yugoslavia, Poland, India, China, the Philippines, and Iraq. The city proper of Hamilton was home to 67,845 visible minorities in 2006, representing 13.6% of its population, up from 10.9% in 2001. Visible minorities comprised 22.8% of Ontario's population, primarily due to high proportions in Toronto. The population is 84.8% White, 3.0% South Asian/East Indian, 2.8% Black, 1.9% Chinese, 1.5% Aboriginal, 1.2% Southeast Asian, 1.1% Latin American, 1.1% Arab, 0.8% Filipino, and 1.8% Other. Children aged 14 years and under accounted for 17.8% of the population while those 65 years of age and older constituted 14.9%, resulting in an average age of 39.6 years. The most described religion in Hamilton is Christianity although other religions brought by immigrants are also growing. The 2001 census indicates that 77.6% of the population adheres to a Christian denomination, Protestants constituting 37.1% of the population, while Catholics number 35.5% (significantly lower than the national average) with Christ the King Cathedral as the seat of the Diocese of Hamilton. The remaining 5.0% consists of Orthodox and independent Christian churches. The largest non-Christian religion is Islam with 12,880 adherents or 2.0% of the total population. Other religions, including Judaism, Buddhism, Jainism and Hinduism, constitute less than one percent each. Those with no religious affiliation accounted for 115,510 (17.6%) in 2001. Environics Analytics, a geodemographic marketing firm that created 66 different "clusters" of people complete with profiles of how they live, what they think and what they consume, sees a future Hamilton with younger upscale Hamiltonians—who are tech savvy and university educated—choosing to live in the downtown and surrounding areas rather than just visiting intermittently. More two and three storey townhouses and apartments will be built on downtown lots; small condos will be built on vacant spaces in areas such as Dundas and Westdale to accommodate newly retired seniors; and more retail and commercial zones will be created. The city is also expected to grow by more than 28,000 people and 18,000 households by the year 2012. The most important economic activity in Ontario is manufacturing, and the Toronto–Hamilton region is the most highly industrialized section of the country. The area from Oshawa, Ontario around the west end of Lake Ontario to Niagara Falls, with Hamilton at its centre, is known as the Golden Horseshoe and has a population of approximately 8.1 million people. The phrase was first used by Westinghouse President, Herbert H. Rogge, in a speech to the Hamilton Chamber of Commerce, on January 12, 1954. "Hamilton in 50 years will be the forward cleat in a golden horseshoe of industrial development from Oshawa to the Niagara River...150 miles long and 50 miles (80 km) wide...It will run from Niagara Falls on the south to about Oshawa on the north and take in numerous cities and towns already there, including Hamilton and Toronto." With sixty percent of Canada's steel being produced in Hamilton by Stelco and Dofasco, the city has become known as the Steel Capital of Canada. After nearly declaring bankruptcy, Stelco returned to profitability in 2004 and on August 26, 2007 United States Steel Corporation acquired Stelco for C$38.50 in cash per share, owning more than 76 percent of Stelco's outstanding shares. Dofasco, in 1999, was the most profitable steel producer in North America and in 2000, the most profitable in Canada. It currently has approximately 7,300 employees at its Hamilton plant and produces over four million tons of steel annually, representing about 30% of Canada's flat rolled sheet steel shipments. Dofasco is one of North America's most profitable steel companies, and Dofasco was named to the Dow Jones Sustainability World Index in 2006 for the seventh year in a row. Dofasco produces steel products for the automotive, construction, energy, manufacturing, pipe and tube, appliance, packaging and steel distribution industries. Dofasco is currently a standalone subsidiary of Arcelor Mittal, the world's largest steel producer. Previously ordered by the U.S. Department of Justice to divest itself of the Canadian company, Arcelor Mittal has now been allowed to retain Dofasco provided it sells several of its American assets instead. Originally, in the 1940s, the John C. Munro Hamilton International Airport was used as a wartime air force training station. Today TradePort International Corporation manages and operates the John C. Munro Hamilton International Airport. Under TradePort management, passenger traffic at the Hamilton terminal has increased from 90,000 in 1996 to approximately 900,000 in 2002. The airport's mid-term target for growth in its passenger service is five million air travelers annually. The air cargo sector of the airport has 24-7 operational capability and strategic geographic location, allowing its capacity to increase by 50% since 1996; 91,000 metric tonnes (100,000 tons) of cargo passed through the airport in 2002. Courier companies with operations at the airport include United Parcel Service and Cargojet Canada. In 2003, the city began developing a 30-year growth management strategy which called, in part, for a massive aerotropolis industrial park centred around Hamilton Airport. The aerotropolis proposal, now known as the Airport Employment Growth District, is touted as a solution to the city's shortage of employment lands. Hamilton turned over operation of the airport to TradePort International Corp. in 1996. In 2007, YVR Airport Services (YVRAS), which runs the Vancouver International Airport, took over 100 per cent ownership of TradePort in a $13-million deal. The airport is also home to the Canadian Warplane Heritage Museum. A report by Hemson Consulting identified an opportunity to develop 1,000 hectares (2,500 acres) of greenfields (the size of the Royal Botanical Gardens) that could generate an estimated 90,000 jobs by 2031. A proposed aerotropolis industrial park at Highway 6 and 403, has been debated at City Hall for years. Opponents feel the city needs to do more investigation about the cost to taxpayers before embarking on the project. Columbia International College is Canada's largest private boarding high school, with over 1,700 students from over 70 countries. Public education for students from kindergarten through high school is administered by three school boards. The Hamilton-Wentworth District School Board manages 114 public schools, while the Hamilton-Wentworth Catholic District School Board operates 55 schools in the greater Hamilton area. The Conseil scolaire de district du Centre-Sud-Ouest operates one elementary and one secondary school (École secondaire Georges-P.-Vanier), and the Conseil scolaire de district catholique Centre-Sud operates two elementary schools and one secondary school. Calvin Christian School and Timothy Christian are private Christian elementary schools. Hamilton District Christian High School (HDCH), Rehoboth Christian High School and Guido de Bres Christian High School are private Christian high schools in the area. Hillfield Strathallan College is located on the West Hamilton Mountain and is a CAIS member, non-profit school for children from early Montessori ages through grade twelve. The Dundas Valley School of Art is an independent art school which has serviced the Hamilton region since 1964. Students range in age from 4 years old to senior citizens and enrolment as of February 2007 was close to 4,000. In 1998, a new full time diploma programme was launched as a joint venture with McMaster University. The faculty and staff are highly regarded regional artists. The Hamilton Conservatory for the Arts is home to many of the area's talented young actors, dancers, musicians, singers and visual artists. The school is equipped with a keyboard studio, spacious dance studios, art and sculpting studios, gallery space and a 300 seat recital hall. HCA offers over 90 programs for ages 3–93, creating a "united nations" of arts under one roof. The Hamilton Literacy Council is a non-profit organization that provides basic (grade 1 - 5 equivalent) training in reading, writing, and math to English-speaking adults. The council's service is free, private, and one-to-one. It started to assist adults with their literacy skills in 1973. Hamilton is home to two think tanks, the Centre for Cultural Renewal and Cardus, which deals with social architecture, culture, urbanology, economics and education and also publishes the LexView Policy Journal and Comment Magazine. Founded in 1914, the Art Gallery of Hamilton is Ontario's third largest public art gallery. The gallery has over 9,000 works in its permanent collection that focus on three areas: 19th century European, Historical Canadian and Contemporary Canadian. 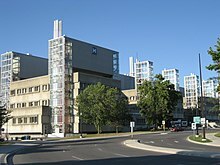 The McMaster Museum of Art (MMA), founded at McMaster University in 1967, houses and exhibits the University’s art collection of more than 7,000 objects, including historical, modern and contemporary art, the Levy Collection of Impressionist and Post Impressionist paintings, and a collection of over 300 German Expressionist prints. Hamilton has quite an active theatre scene, with the professional company Theatre Aquarius, plus long-time amateur companies, the Players' Guild of Hamilton and Hamilton Theatre Inc.. Many smaller theatre companies have also opened in the past decade, bringing a variety of theatre to the area. Growth in the arts and culture sector has garnered high level media attention for Hamilton. A Globe and Mail article in 2006, entitled "Go West, Young Artist," focused on the growing art scene in Hamilton. The Factory: Hamilton Media Arts Centre, opened up a new home on James Street North in 2006. Art galleries are springing up on many streets across the City: James Street, Locke Street and King Street, to name a few. This, coupled with growth in the downtown condo market which is drawing people back to the core, is having an impact on the cultural fabric of the city. The opening of the Downtown Arts Centre on Rebecca Street has spurred further creative activities in the core. The Community Centre for Media Arts (CCMA) continues to operate in downtown Hamilton. The CCMA works with marginalized populations and combines new media services such as website development, graphic design, video, and information technology, with arts education and skills development programming. The 2009 film Defendor, starring Woody Harrelson as a vigilante superhero, is implied to take place in Hamilton, referred to by its nickname of "Hammer Town" several times throughout the film. It was filmed in Hamilton and Toronto.